A student from City University London has won the prestigious Fly Your Ideas competition, taking home his share of a €30,000 prize. The Fly Your Ideas competition, organised by Airbus in partnership with UNESCO, challenges students to innovate for the future of aviation. 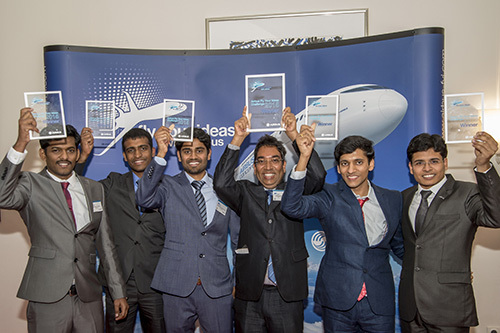 Dhamotharan Veerasamy (pictured on the far left of the image), who studies for a PHD in Aeronautical Engineering at City, was joined by four students from across the world to form Team Multifun. Their winning idea was to dress plane wings in a composite skin that harvests energy from natural vibrations. Members of Team Multifun, hail from Georgia Institute of Technology, USA; Delft University of Technology, Netherlands and Indian Institute of Science, Bangalore, India alongside City. The team beat more than 500 other entries to reach the final round and were invited to Hamburg to present their idea to a panel of industry experts where they were crowned the winners. Team Bolleboos, comprised of three doctoral students from City, also reached the final round with their design to wirelessly power planes while taxiing. Judit Guimera Busquets, Evelien Van-Bokhorst and Isabella Fumarola met while studying for a PHD in Aeronautics Engineering at City. 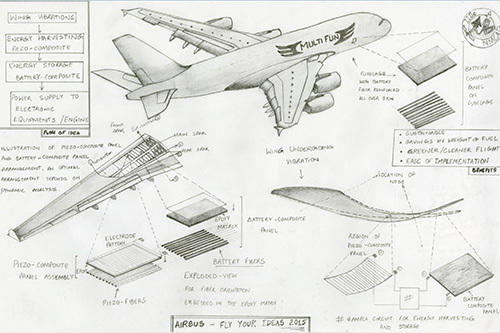 The team’s idea entails aircraft wings dressed in a composite skin that harvests energy from natural vibrations in the wings. Piezoelectric fibres gather electrical charges from even the smallest movements during flight and the energy generated would be used to power in-flight systems, such as lighting and entertainment. This reduces the energy footprint of aircraft during flight and could even replace the entire power source for ground operations. Piezoelectricity is the electric charge that accumulates in certain solid materials in response to mechanical stress.